Jacqueline Adams, Yasmin Akhtar, Joanne Ainge, Beth Andrews, David Barker, Simon Berry, Stuart Boyd, Alison Cooper, Iain Daniels, Kelsey Desmond, Sarah Dolby, Richard Dove, Jason Frost, Emma Griffiths, Paul Groombridge, Alison Hodgkins, Angela Instone, Shazia Jaffri, Adjinder Kaur, Alison Lake, Steven Lea, Duncan Matthews, Neville Moody, Darren Morris, James Morris, Steven Pettit, Nicky Price, Faizal Rafiq, Richard Sadler, Gillian Shakespeare, Michelle Simms, Lahkvir Singh, Chris Southan and Sarah Turner. Commissioned by Small Acts at the Millennium and supported by The Arts Council of England and Site Gallery, Sheffield. In May 1976, 35 children posed for this class photograph in the hall of Chuckery Infant School in Walsall. In February 2000 Alex Kelly (second row, second from the left) started looking for the other 34 kids to ask them what they’d been doing for the last 24 years. 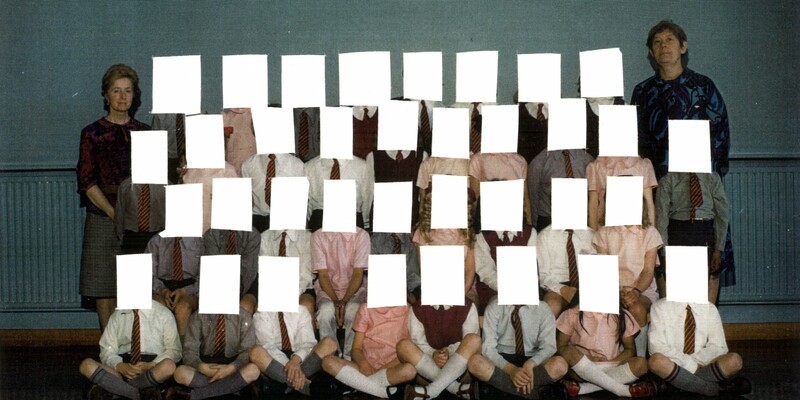 In May 2000 Third Angel performed Class of ‘76 in Chuckery Infant School Hall on the spot the photograph was taken, explaining what Alex had found out about his classmates. A unique live art research and performance project. Performance at Chuckery Infants School, May 2000. 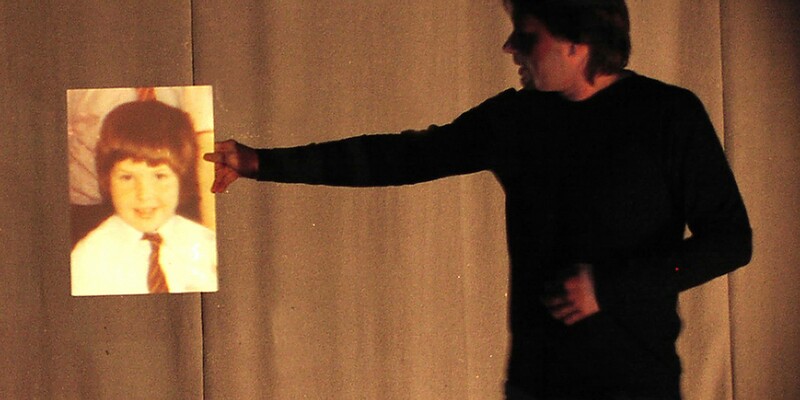 Performance/Lecture first presented at Site Gallery, Sheffield in 2001, then toured the UK ‘occasionally’ until 2006, with a performance at the Trama Festival, Porto. A DVD recording of Class of ‘76 (from the 10th Anniversary tour) is held in the British Library’s Sound and Moving Image archive. Class of ’76 is discussed in several articles on the old Third Angel blog. Govan, Emma, Nicholson, Helen and Normington, Katie. (2007). Making a Performance. London: Routledge. Kelly, Alexander. (2001). What Can I Tell You? In Small Acts: Performance, the Millennium and the Marking Of Time. Ed. Adrian Heathfield. Black Dog Publishing. Spence, Jocelyn. (2016). Performative Experience Design. Springer, Switzerland. Spence, Jocelyn, Andrews, Stuart and Frohlich, David. (2012). Now, where was I? Negotiating time in digitally augmented autobiographical performance. Journal of Media Practice, 13, 3. London: Taylor & Francis. Heddon, Deirdre. (2008). Autobiography and Performance. Basingstoke: Palgrave Macmillan. Heddon, Deirdre and Kelly, Alexander. (2010). Distance Dramaturgy. Contemporary Theatre Review, 20:2, 214-220. London: Routledge. Heddon, Deirdre & Milling, Jane. (2005). Devising Performance: A critical history. Basingstoke: Palgrave Macmillan. Telling Other People’s Stories: Thinking about authorship & responsibility in Third Angel’s solo auto/biographical projects. (2016). Invited Paper for TaPRA Interim Event: Training to give evidence: Performer training for verbatim, documentary, biographical and autobiographical performance practices. Northumbria University. Also given at Where From Here: 21 Years of Third Angel, Leeds Beckett University (2016). What Makes Me Me, What Makes You You? (2014). Invited Paper for Identity: The Prequel, multi-disciplinary mini-conference, School of English, University of Sheffield. Also delivered for MA Performance course, Leeds Beckett University (2015). 10 Years of Class of ’76. (2010). Fierce Festival Interrobang 2, Wednesbury. Small Acts: Performance, the Millennium and the Marking of Time book launch. (2001). National Review of Live Art, The Arches, Glasgow. Third Angel: Class of ’76. (2001). Brunel University. Third Angel: Live Art Projects. (2001). Waygood Gallery, Newcastle. Spence, Jocelyn. (2016). Between Cape Wrath and Class of ’76. Paper at Where From Here: 21 Years of Third Angel. Leeds Beckett University. So here I am, about to embark on the 10th Anniversary Tour of Class of ‘76. Ten years later, still telling this story. In those ten years the idea of the show has almost become an anachronism. The show started as a 15 minute sketch, in which the things we said about the children in the photograph, including some of their names, were completely made up. And although we had the idea for a second version in 1999, it was in January 2000 that I set about trying to find the other 34 children in my infant school photo, before performing ‘Version 2’ of the show in Chuckery Infant School Hall in May of that year. That’s the anniversary that this, final, tour of the show marks. In January 2000 I had an email address, and connection to the internet at work, but, despite our later publicity tag of ‘fresh and funny live art for the friendsreunited generation’, there was no Friends Reunited yet, let alone Facebook, Myspace, Bebo or Twitter. I had a mobile phone, but had only had it since I was 28 – so no immediate connection to my old schoolmates. The process of tracking people down, therefore, involved phone calls, mainly to land lines, and a lot of ‘going back home’ to Walsall. Of course this massively affected the nature of the piece. Had I been able to do all the detective work remotely, I think the work would have felt quite different. It would probably have been more about the lives that the people are living now, as I would be able to visit, or at least observe, a lot of those lives online. Which is why the idea of the show feels like an anachronism - kids at school now, and anyone who left school within the last - what, 10 years? - wouldn’t need to track down most of their classmates; they’ll already have contact with them. ‘Version 3’ of Class of ‘76 - the version that talks about the process of making Version 2 - has been in repertoire since 2001, although it was temporarily retired for a couple of years in 2006. Reviving the work in 2008, I suddenly felt this historical aspect of the show much more keenly. And this feeling has informed the decision (or is ‘realisation’ more accurate? ), that the performances this year will be the last ones of ‘Version 3’. At post-show discussions over the last 10 years one of the most frequently asked questions has been: Why that photograph? What that year, why that collection of children? The answer is pretty simple: it is my last school group photo. I’ve got two infant school class photos – the second year one from 1975 and this one from May 1976. The following autumn we moved up to junior school, where we always had individual, or sibling group, school photographs taken. So although most of the children in the photograph moved up to the same junior school, this later photo is the one that marks the end of an era – the end of infants school. Our last class photograph. That was the one I had to use. “This layering of versions, experiences, events, and the different ways in which they are retold is not accidental, for at the heart of (at least this version of) Class of ’76, is an anxiety over the relationship between reality and memory, fact and fiction. While the original Class of ’76 worked with the fabricated, it would be a mistake to take the second performance as being any closer to reality. Kelly’s deliberately repeated refrain, ‘we perform Class of ’76 in Chuckery Infants School Hall, on the spot the photograph was taken, and this time we tell the truth’, surely issues warning enough. Kelly’s recollections are literally made up from the encounters he has with old classmates, whose memories are in turn as partial, fragmented and fragile as Kelly’s own. And as he stands in front of us tonight, recounting other versions of his story of Class of ’76, we would also do well to remember that these are similarly retellings: honed, edited, selected, arranged and skilfully presented. Alongside those tales that are remembered and told, there are the stories that are secreted, unheard, forgotten, avoided. The silences that accompany the faces that slipped the detective’s net speak loudly. There is, in the end, nothing simple in Kelly’s informal manner, his intimate chat, his personable persona. “It’s a magical and beautiful device that unifies the piece, an elusive and allusive metaphor of memory that we only ever catch in hovering fragments. “In fact, his quest to track down and contact all the children in the photo was communicated with such gusto and enthusiasm that it was impossible not to get drawn in. Although a mass of minute and particular detail, Kelly’s lecture asked a bigger question – at what point does memory take on a life of its own separate from truth and reality? And how is it that two people can have a completely different recollection of the same events?